March 14, 2014 · by Zack Reyes · Post may contain affiliate links. See my disclosure policy here. Tide coupons are some of the most sought after coupons out there. 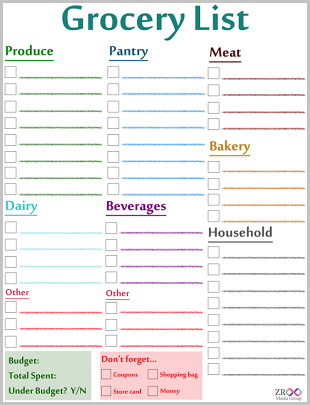 Thankfully, they are often readily available in the form of internet printables and insert coupons. A lovely P&G Brand Saver comes in the Sunday paper at the beginning of every month that usually has 3, 4 or more coupons for Tide products. To stretch these Tide coupons even further, many drugstores put Tide on sale and offer store rewards for purchasing certain amounts of Tide. With coupons and store deals, you can score some pretty nice deals on Tide laundry detergent and laundry products. Tide is a P&G brand, which also means that sometimes, Tide products are included in rebates or special offers. A lot of times, you can use coupons with these special offers, so keep you eye out for those. Tide has been pushing their Tide Pods lately, so a lot of the available Tide coupons are for those. That being said, there are still coupons for good ole fashioned Tide laundry detergent quite often. Target regularly has store coupons for Tide that can be used in conjunction with Tide manufacturer coupons. Additionally, they sometimes offer Target gift cards for purchasing certain quantities of Tide. You can use a store coupon and a manufacturer coupon when doing one of these deals to triple up your savings. When it comes to newspaper inserts, keep your eyes open because Tide coupons could be anywhere. At the time of this post, there were current Tide coupons in the P&G Saver, a Smart Source and a Red Plum insert. Additionally, there was three available to print on coupons.com as well. When it comes to laundry detergent, people love their Tide. 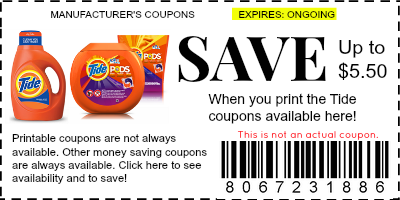 Why not save some money by having internet printable manufacturer coupons ready to use when Tide goes on sale or is part of a store promotion?! You can also request Tide coupons directly from P&G on their website. What are some other places where you find Tide coupons. Colgate coupons are available to print very often. There are also Colgate coupons very frequently in the Sunday paper inserts. Additionally, the drugstores seem to like putting Colgate products in their weekly sales and reward deals. Combining the sales with Colgate coupons can mean a big savings for you. There always seems to be a nice variety of Colgate coupons. When they release new printable manufacturer coupons, they seem to release them in sets. There are coupons for toothpaste, toothbrushes and mouthwash. Sometimes there are a couple of each one out! One thing I noticed about the Colgate coupons that come out in the Sunday newspaper inserts is that they have short expiration dates. They seem to expire within 2 weeks of the release date. 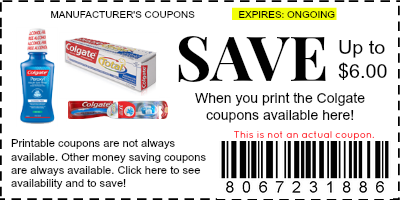 Because most printable coupons don't expire for one month after you print it, I encourage you to print Colgate coupons when you do see them available online. Having the coupon a longer period of time will give you more chances to find great sales to combine with your coupons. Colgate coupons combined with sales make great deals! With the right combination of Colgate coupons and store deals, you should be able to get Colgate products for free, or close to free after using the coupon on top of a sale and getting a store reward back. I have not paid for Colgate (or any brand of oral care product) products in over 3 years. It's really quite easy, but it starts with having the coupons ready to go when you do find that sale. I can't tell you how many times I try to save ink and avoid printing a coupons, only to regret it later when that item goes on sale and it would have been free with coupon! Don't let that happen to you! For up-to-date notifications on when Colgate coupons become available online, follow me on social media and bookmark this site. When you're looking for Nabisco coupons, it helps to narrow down your search by product. You see, there are a LOT of products under the Nabisco label. There are Oreos, Nilla Wafers, Cheese Nips, Triscuits and Wheat Thins to name just a few. Because of this, there are almost always Nabisco coupons of some type available on the internet and in coupon inserts. Nabisco coupons are generally found in the Smart Source when found in the Sunday inserts. There is almost always some kind of Nabisco coupon online as well. 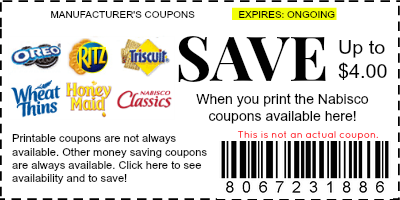 The Nabisco coupons online generally only show up for a limited time, so you're going to want to print them as soon as they become available. Follow this sit eon social media or bookmark it and check back often for notifications of whether or not Nabisco coupons are currently available. You can also find Nabisco coupons by just keeping your eyes open at the grocery store. Nabisco is one of the companies that uses tearpad coupons and product peelie coupons the most. You'll commonly find coupons stuck onto products. It is common knowledge in the coupon world that it is not courteous to remove a peelie if you don't plan on buying that product at that time. Additionally, when it comes to tearpads, you should take a reasonable amount (1-2) and leave the rest. It's not a free-for-all here. Most commonly, you'll see Nabisco coupons for an assortment of crackers, or coupons for their Oreo line. Nabisco also sometimes has post-checkout offers from Ibotta and Checkout 51, where you can earn a cash back rebate for buying Nabisco products! You can use a manufacturer coupon and get a cash back offer from one of these companies (if they have an offer available) to double up on your savings. If you shop at a store with store coupons (like Target), you can potentially triple your savings by using a store coupons, manufacturer coupon and a post-checkout offer! Crazy talk! Where have you seen Nabisco coupons? Progresso soup coupons are generally pretty easy to find. If they're not in the weekend coupon inserts, you can usually find them online. Progresso recently came out with a line of Recipe Starters. They released some nice coupons for those and many people were able (and still are able) to get the products for around $0.50 or less. Most of the regular Progresso soup coupons are pretty low in value, but occasionally they release a limited time high value coupon. Recently, they had a $1 off 1 coupon that made for some free soup and lots of happy couponers! If I were to guess, the average Progresso soup coupons would be $0.50/2. Saving $0.25 per can of soup isn't fantastic, but they occasionally go on sale for $1 a can at many grocery stores. Progresso soup coupons can be found right on the Progresso website! Yep! You can also find Progresso soup coupons and other Progresso coupons directly on their website. I like that they have them right there for you. It always bugs me when companies have online printable coupons located everywhere on the internet except for on their own website. 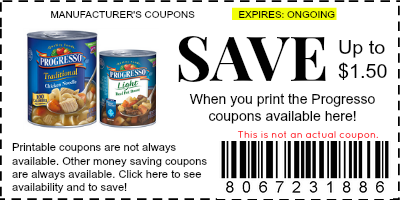 Since there now seems to be more Progresso Recipe Starters coupons than their are Progresso soup coupons, be careful and be sure you are printing the coupons you want. Also, for clarification, the Recipe Starters are NOT soup. We see Progresso soup coupons every time there are a lot of General Mills coupons in the Sunday paper. There also seem to be new ones released at the beginning of every month. That is a good time to come back here and print them, since they'll last all month once you get them printed, but you don't know how long they will stay available online for printing. If you know of anywhere else where we can find Progresso soup coupons, please leave a comment below and let us know where to look! It's pretty common to find Lean Cuisine coupons online. Generally, Lean Cuisine coupons seem to be money saving offers off of the purchase of several products. We commonly see $1 off of 5, or something like that. This doesn't equate to a tremendous savings per item, but when we stack that coupon with a store sale or catalina offer, the savings can really add up. FYI, you can check for Lean Cuisine coupons and other money saving coupons right underneath of this post! There are many different types of Lean Cuisine products, so make sure to read the details of your coupon carefully to make sure that you are not only using them correctly, but you are maximizing your savings as best you can. Lean Cuisine coupons can be found in many places! We also commonly see Lean Cuisine coupons in the Smart Source insert in the Sunday paper. 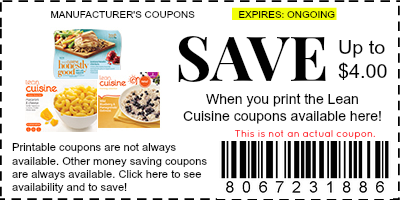 While the value of the coupon is generally the same as what is available online, printing online gives you two additional coupons for every printing computer that you have in your house! The best deal I have seen using Lean Cuisine coupons was at Target. Target lets you use a manufacturer coupons with a Target store coupon. Additionally, they were offering a $5 Target gift card when you purchased a certain number of Lean Cuisine products. Combining the two coupons with the gift card deal made for an excellent price for each product. Target cycles their sales, so this is bound to come back around sometime soon! If you know of any other sources for Lean Cuisine coupons, please leave a note in the comment section here!